It’s not a typical path to entrepreneurship: a bachelor of arts in religion, followed by doctoral study of religion with training in what’s often considered a dead language to boot. But the knowledge Marcy Braverman Goldstein ’92 has painstakingly acquired, and which she shares with tuition-paying college students near her home in Charlotte, N.C., is knowledge she’s discovered many other people in her community would like to have themselves. “I realized the knowledge from my education—the actual content of it—was something that many people truly want to know. And they don’t necessarily want to pay $2,000 to take a course at their local university,” Goldstein says. Goldstein majored in religion at Rochester and developed a special interest in Hinduism and its scriptural language, Sanskrit. At the time, she says, “my interests seemed obscure.” But she continued her studies, earning a doctorate at the University of California at Santa Barbara. Among the world’s most ancient languages, Sanskrit is rarely spoken. Yet it’s the language of an increasingly popular activity in the West: yoga. Yoga is a multimillion dollar industry in the United States alone. And as evidence has mounted for its benefits to physical and mental health, physicians and other health professionals have begun to integrate yoga in their treatment plans. Yet the quality of yoga instruction is uneven, and an important element missing in much of it, Goldstein says, is Sanskrit. 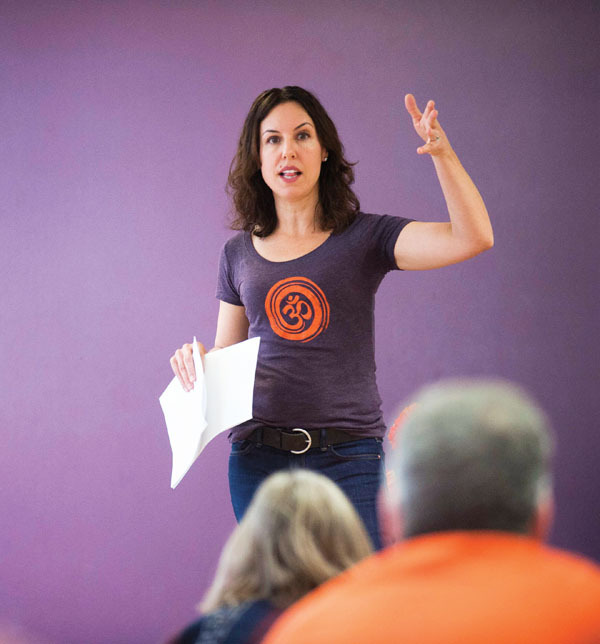 Two years ago, she founded Sanskrit Revolution, a sole proprietorship through which she offers Sanskrit workshops for yoga instructors and students. She’s enjoyed as much demand as she can take on while still continuing to teach at the college level—something she has no plans to abandon. Sanskrit words don’t just name every pose—or, in Sanskrit, a¯sana. Their sounds are an integral part of the practice of yoga itself. Some instructors have begun to incorporate more Sanskrit into their lessons—replacing English names for poses, such as the “corpse pose,” for example, with its Sanskrit name, śava¯sana—but with few places to turn for accurate knowledge of the language, mispronunciations are common. This latter group is an eager audience for what Goldstein offers. “I sometimes say to people, ‘How do you soothe a sleeping baby? Do you go to the baby and say, ‘kuh kuh kuh kuh’? Or do you say ‘shhhh’?,” she says. In her workshops, she goes over the most commonly mispronounced āsanas, exploring their meanings by breaking the words down into their roots, and discussing the shades of meaning implied in each syllable. 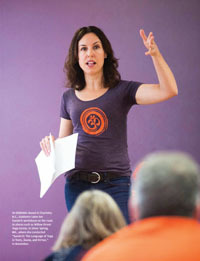 Participants in her workshops earn what’s called a CEU, or continuing education unit, part of an effort by the national governing body the Yoga Alliance to professionalize—a development Goldstein embraces, particularly given the increasing interest in yoga by health practitioners who’ve undergone rigorous training in their own fields. As is the case for many entrepreneurs, digital tools have made it possible for her to reach a wide audience. She traces the start of her business to the day she bought the domain name for her website, www. sanskritrevolution.com, and has since added a Facebook page. In addition to a schedule, information, and links, Goldstein is working on a Sanskrit dictionary that will be downloadable as an app. She envisions adding to her website an online store for the purchase of study materials and Sanskrit Revolution gear. And she’s exploring online teaching as well.